This is the summary of consumer reviews for Ryobi ONE+ 18-Volt Lithium-Ion Drill and Impact Driver Combo Kit (Model: P882). The BoolPool rating for this product is Excellent, with 4.70 stars, and the price range is $129.00-$158.95. Ryobi ONE+ P882 is a 18-Volt Drill and Impact Driver Combo Kit which is powered by new and improved lithium-ion batteries. These batteries hold a charge 4X longer, offer up to 20% more runtime and are 45% lighter weight than Ni-Cd batteries. The drill includes a 1/2 inch heavy-duty single sleeve, well balanced, keyless chuck with 24 position clutch to match any drilling and driving needs. The impact driver has a variable speed trigger and 1,500 in.-lbs. of torque to provide control and power when driving long and large screwed or bolts. They both feature the exclusive MagTray and on-board bit storage, which allow convenient placement of bits and screws. These tools are lightweight yet powerful and good quality with overmold grip area for increased user comfort. This kit comes with a great bag which is just the right size for the tools plus some extras. Users love this Ryobi combo kit but they miss the battery level indicator on the tools. 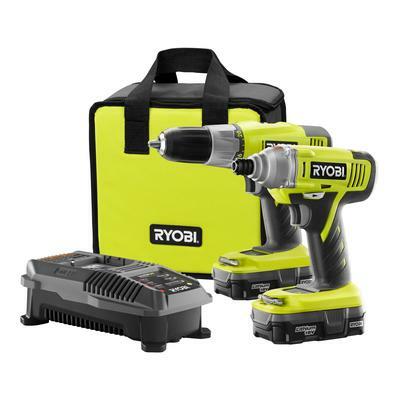 Overall, the Ryobi ONE+ Any 18V 18-Volt Drill and Impact Driver Combo Kit is a great set of cordless tools for any handyman, homeowner or DIY person. The best part is that ONE+ battery works with any 18V ONE+ tool making them the tool of choice for many people. The is a review on here that says u can buy this at Home Depot for 99 but at my Home Depot it's the same price as this one. Unbeatable pricing for what you get. You can't beat the price of the combo kit! Great tools for a very decent price! This's a great product and for a excellent price. Great features and at a great price. The $99 price I got the pair at can't be beat either! Still got sale price online after store promo ended. Knowing that Lithium-ion was the better battery, I'd been waiting for the prices to come down to a reasonable level to buy one. works great, great price, and eat to use with nice weight and power for a wireless powered system. There's no battery power indicator. This's great power and excellent batteries life. I bought the drill and driver combination because I wanted more powerful cordless tools. Charger is fast and great deal and power for the $99 price tag. They work just fine and I was glad for the added power. I was skeptic at first - but the torque power and weight has made this a no brianer. The drill has a powerful 2 speed motor and the impact driver has good torque. impact wrench worked well when I'd to change a flat tire, it'd plenty of power and seemed lighter than the old style. I built 2 sets of stairs finished my fence and hung up some OSB still had power. The price and having lithium batteries are what sold me. Product is outstanding and lithium battery last and performs better. Awesome price, 2 batteries, which also work in my old one+. I needed new batteries for my other Ryobi tools, so i purchased this kit for the same price as two lithium batteries alone. I'd priced the 2 pack Lithium battery pack at about 139.00.......Then I saw this combo kit drill/driver combo with duak lithium battery for 99.00, Making this buy was a no-brainer. 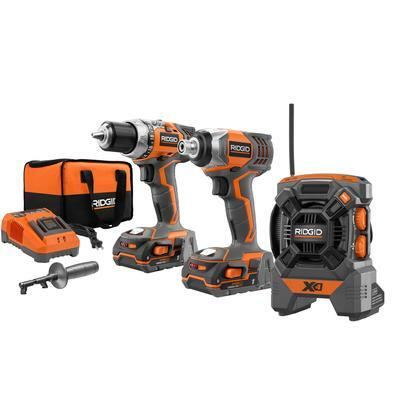 This set at this price, considering just a set of two lithium batteries is $79 (without a charger) and the ratcheting drill is $99 with no batteries. My first impact driver and first lithium ion power tool. One battery went bad within 3 months. great price, great value, it was as cheap as just buying the batteries. Lithium Ion Batteries hold a charge for a long time and the ratings on the impact driver are very good. I've used both drills and the batteries charge fast and stay charged for a longgggggg time. Fast charge and lasts a long time. The batteries charge quickly and hold the charge nicely. i use this set professionally daily, the battery lasts a very long time, charges very fast, both the drill and impact driver has plenty of power. A big plus is that it comes with two batteries and if you've ever seen the price of lithium batteries or you've had one battery go dead you'll appreciate the extra battery. The batteries feel kind of light; they don't last a long time on a charge, but they're Lithium-Ion batteries, which hold charge on the shelf for a year or so, which is very convenient. It's their tier 2 battery, not the tier one batteries. Batteries keep their charge and are always ready, the drills are ergo and fit my hand perfectly. Balance and power are excellent, and the batteries recharge in less than an hour. The lithium batteries are amazing, the drill doesn't slow down as the battery dies. I purchased the two drills, 2 batteries and charger because my ni-cad batteries were near death. Even better, the new charger recognized and restored my old ni-cad batteries and now I've 4 good batteries and some spare drills. The battery life is great. One battery died within a week and HD replaced - thanks. After depleting the battery driving dozens of 3" screws into green PT lumber a quick battery swap allowed me to continue but the other battery was fully re-charged in just over 30 minutes! I only used the drill/driver so far but it alone with the spare batteries would be a good deal, light weight, battery and charger state of the art good brand reliability. One battery fits all the tools Lightweight, powerful, lots of additional tools available using same battery A great deal for quality tools Really nice tools to work with Bag works just right for the tools plus enough extra room to carry bits, etc. One battery fits all the tools. This new One+ set's batteries work with my old tools as well. I really bought these tools for the batteries. Lightweight, powerful, lots of additional tools available using same battery. These 2 tools for a 100 dollars plus batteries and a charger.....it's a great deal for quality tools. it'll outlast other battery and does everything the other brand does at a third of the price interchanges batteries with every other tool and has an incredible charger plus Ryobi doesn't make the old tools obsolete when they change batteries. Really nice tools to work with. Ryobi makes it easy, because all the tools work on the same batteries!!!!!!. Awesome tool set and the bag works just right for the tools plus enough extra room to carry bits, etc. Love the ability of batteries to recharge quickly. Great tool combo, light weight and easy to use and just love the ion batteries.